If the powers that be in the Evereskan government need someone eliminated, it's Irilivar Celevessin that gets the job. You'll need every ounce of cunning to survive this Evereskan assassin. Irilivar Celevessin: Male elf Rog5; CR 5; Medium-size humanoid; HD 5d6+5; hp 24; Init +8 (+4 Dex, +4 Improved Initiative); Spd 30 ft.; AC 17 (touch 14, flat-footed 17); Atk +5 melee (1d8+2/19-20/x2, +1 longsword); SA sneak attack (+3d6); SQ elf traits, evasion, traps, uncanny dodge; AL N; SV Fort +2, Ref +8, Will +4; Str 13, Dex 18, Con 12, Int 17, Wis 16, Cha 13. Skills and Feats: Balance +10, Climb +7, Craft (trapmaking) +8, Disable Device +9, Disguise +7, Escape Artist +11, Gather Information +6, Hide +11, Knowledge (architecture and engineering) +6, Listen +13, Move Silently +11, Open Lock +10, Ride (horse) +6, Search +11, Spot +13, Swim +6; Alertness, Improved Initiative. Possessions: +1 leather armor, +1 ring of protection, two potions of invisibility, +1 longsword, shortbow, 30 arrows, variable quantities of smokepowder and bomb-making items (always hidden), masterwork artisan's tools for bomb making (always hidden), masterwork thieves' tools, disguise kit, coinage of 50 gp or less, assorted unremarkable clothing, boots, and gloves. All items appear dirty and much used; magic items are concealed in old sheaths, under gloves, etc. Irilivar has a normal suit of leather armor that he wears when scouting a target in disguise. Irilivar is notable primarily because he is not notable, being unremarkable in appearance and mannerisms. A moon elf, Irilivar is slightly below average in height and weight (5 feet 6 inches, 125 pounds), with bland facial features and a constant look of weary boredom. His clothing varies but is nearly always worn, dusty, and dull in color, and his dark hair is uncombed. He looks like he doesn't have a lot of money and must work hard for what he does get. He says little and avoids eye contact when possible except for brief, casual encounters, such as when asking questions. His most typical gesture is a tired shrug. If watched for a longer period, Irilivar's less pleasant personality traits begin to surface. He has little patience and treats others with minimal respect. His requests come across as demands, and his mood darkens swiftly when he is frustrated; his cold stare is remarkable. Irilivar does not directly attack those who trouble him but he will certainly remember them. This demeanor changes when Irilivar works on a project. He becomes animated, tireless, quick, and sure. His deftness and skill are immediately apparent. He wastes no time in attacking his assignment with visible eagerness. His impassive facial expression, however, rarely changes. People who actually get to know him (currently just his superiors in Evereska) know he is rather paranoid, but this is understandable given his line of work. Irilivar was born somewhere in the High Forest about 160 years ago. His family noted early on that he was not only a loner but lacked any form of compassion for other beings. In his youth, he disappeared on long journeys into the woods. His family preferred to think he was only hunting game and did not question him about his activities, as they already feared his temper. They praised him nonetheless for his cleverness with tools, as he was an unusually patient and gifted weapons crafter. His family moved to Evereska to escape a feud with another elven family after Irilivar killed some of their pets in gruesome ways. In desperation, his family sought the help of someone who could at least moderate Irilivar's increasingly heartless behavior. A commander in Evereska's military heard them out, spoke with Irilivar for an evening, then enrolled him in a little-known school that Evereska used to train what were glibly called "unconventional diplomatic agents" (spies, saboteurs, scouts, assassins, thieves, and other necessary but unacknowledged professions). Few within the government are even aware of this school or its graduates, who performed numerous missions across Faerûn in support of Evereska and its policies, most often (but not exclusively) against evil governments and cults that desire Evereska's destruction. Evereska's government is itself somewhat chaotic, and some elves in it have no love for anything or anyone who is not elven. Irilivar fits perfectly into their plans. Irilivar graduated seven years ago from a program recently instituted at the school, which has no official name itself. He is a trapmaker who specializes in setting smokepowder traps and throwing similar bombs. Since smokepowder was introduced to Faerûn during the Time of Troubles, its use has slowly spread to a variety of peoples, and the elves (as much as they dislike it) are no exception. Irilivar's combat expertise lies not in melee, but in carefully planned ambushes involving exploding traps and flung bombs. He does most of his scouting while invisible, but he sometimes comes in plain view to question locals if he feels he can get away with it. His attack method selected, Irilivar then gets a large quantity of smokepowder from certain people (well paid by third parties) to whom Irilivar is directed by his supervisor. He then manufactures an appropriate trap, supplementing its destructive power with smokepowder bombs. Irilivar is effective at sneaking in to a target's residence, placing a trap quickly and efficiently, and sneaking out again. He prefers to set traps in a target's own home-the target's feeling of safety almost ensures that the trap will go unnoticed until it is triggered. He has been very successful of late, eliminating three minor political threats to Evereska in the past year. He has also finished a personal vendetta by blowing up an annoying Baldur's Gate merchant and his wagon on a Sword Coast wilderness road. Irilivar's superiors are unaware of this last "exercise." All told, he is responsible for about five dozen deaths and eight-score injured victims across the Western Heartlands and Sword Coast. Most of these victims were quite evil, but some were not; a bomb isn't a choosy weapon, and innocents sometimes get in the way during a mission. Irilivar, though sociopathic, is relatively loyal to his superiors in Evereska. Only through them can he get his supplies of smokepowder, his training, and the chance to work unhindered by the government. He is paid well, but the money is unimportant to him. Destructive power is what he wants. His superiors are well aware of this and are careful to keep him far from Evereska, so he is not tempted to turn his talents against his adopted homeland. They also work with him through third parties to avoid having his activities traced back to the Evereskan government. Irilivar is also wise enough to recognize the good deal he has, considering that he would be a hunted criminal (or dead) by now if he had picked any other line of work. For now, he is content to be a professional, do his job, and enjoy the chaos and terror he brings. Irilivar has no established residence as such, staying only a few days in any one place. His workshops are often improvised affairs in rented rooms, abandoned cottages, and so forth. He crosses paths with player characters primarily if they happen to be in the wrong place at the wrong time, namely at the scene of his latest "technical exercise," as his superiors call his missions. He is currently assigned to destroy parts of a ruined castle south of Evereska, as its dungeon is being used by members of the Cult of the Dragon to stage attacks against Evereska's borders. It is highly possible that PCs are hired by other persons, perhaps even unknowing Evereskan officials, to raid the castle at about the same time. The PCs might the bomb attacks, discovering that the noisy attacks have alerted the cultists. They might arrive before Irilivar's attack and end up witnessing the thrown or planted bombs and the destruction they do. They might also arrive before Irilivar himself appears (while invisible) to scout out the place's defenses. 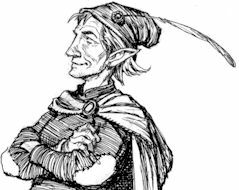 A merchant house in Baldur's Gate might also contact the PCs, asking them to investigate the destruction of a wagonload of valuable furs and cloth. The wagon blew up shortly after leaving a small community near Baldur's Gate, killing the merchant, his aide, and three guards nearby. Five others were wounded. (Perhaps one of the victims was a friend or relative of a PC.) Remnants of the wagon were preserved by others in the caravan and can be given to the PCs. Some items have a sharp, burnt smell that only someone who had previously handled smokepowder would be able to identify. Fragments of the bomb might also have been discovered but not recognized for what they are. The merchant was known to have a bad temper and vile habits, but most people put up with him because he had good connections across the Sword Coast and gave a good return on his trade items. He was known to hate elves, however, and bitterly criticized the end of their Retreat, preferring they all left Faerûn. Irilivar is prone to re-investigate the scenes of his missions, examining the aftereffects of the bomb attacks and trying to devise more effective smokepowder traps. It is possible for PCs to meet him unknowingly in this manner, as they look over the ruins of a structure to figure out what caused the destruction. He has many ways of evading discovery and capture, from stealing horses to taking hostages to cover his escape, but he rarely resorts to such tactics. He prefers to avoid notice entirely. Capturing or killing Irilivar does not fully resolve any given situation. He has very powerful allies (if no friends) within Evereska's government, and these elves will be greatly put out if Irilivar's missions are interrupted, particularly the current one against the Cult of the Dragon. His training was expensive, and he is without a doubt the best at what he does. Though he is heartless and cruel, he has done much good for Evereska, from his superiors' point of view. It is almost certain that missions to free him or raise him from the dead will be undertaken, even if he is held captive by other elves. A dark revenge against his slayers cannot be ruled out.